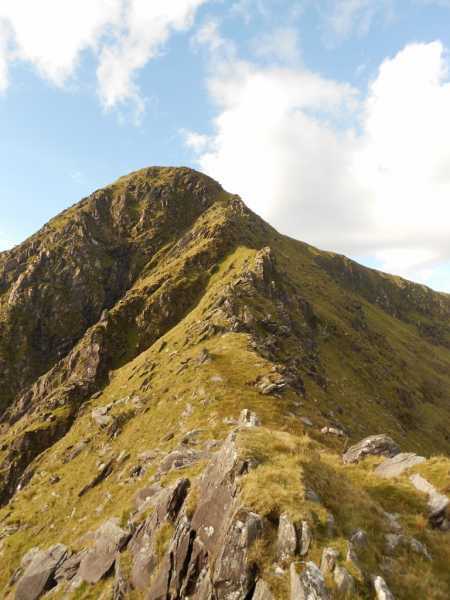 The sharp ridge which climbs to Mullaghnarakill between Coomaglaslaw and Coomnacronia provides one of the most challenging walks in the Glenbeigh Horseshoe area. The lower part of this ridge is known locally as Drom an Bháid or Bottom of the Boat, from its resemblance to an upturned keel. Mullaghnarakill is the 169th highest place in Ireland. Mullaghnarakill is normally experienced as a small rise on the main ridge of the Glenbeigh Horseshoe walk. However, to its north-east, a spectacular ridge rises to the summit between the coums of Coomnacronia and Coomaglaslaw. Though this ridge can be easily ascended, descent would be difficult. The ridge is narrow and exposed on both sides, however the footing is good and hands need to be used only at a couple of points. Views into both coums are spectacular.